The Orthodox of Maine are invited to a private showing of “Mystery of the Christmas Star” on Saturday, December 10 at 1:30 P.M. at the M.F. Jordan Planetarium, University of Maine Orono. 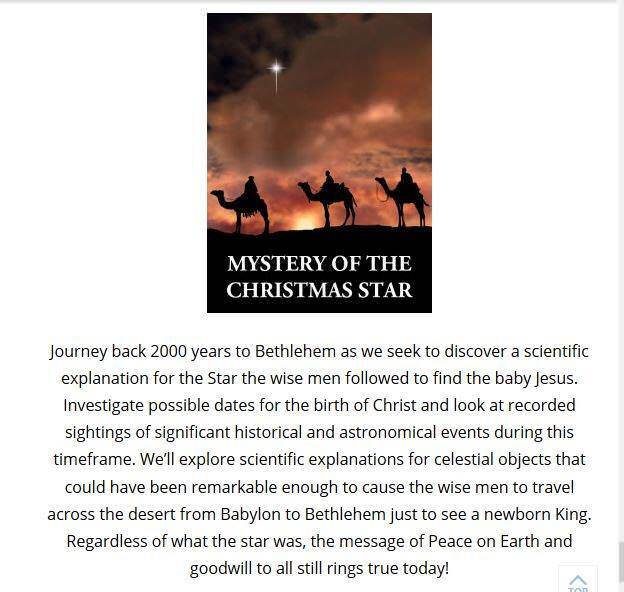 What joy in our coming together to witness this mystery of the Bethlehem Star! We are blessed to have this opportunity to take a trip together to the University of Maine at Orono for a special viewing of the Christmas Star at the planetarium. We are grateful to Ray Goulet, assistant director at the planetarium, for reserving the planetarium and putting on a special show for us. The plan is to attend the presentation with the folks from St. Demetrios (Saco), St. George (Bangor), Our Savior (OCA) church in Old Town/Bango.. Please each of you spread the word to friends and family. Following the viewing, we will enjoy a meal and will socialize at Orono House of Pizza followed by Vespers at St George Greek Orthodox Church in Bangor. It has been suggested. The cost for the planetarium show is $3.50 per person.